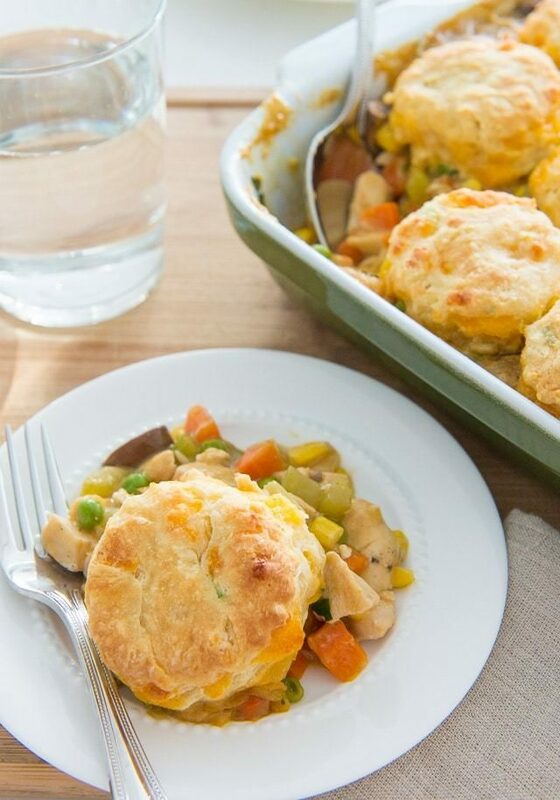 This Cheddar Biscuit Topped Barbecue Chicken Pie is a bold twist on a classic comfort dish — chicken pot pie! 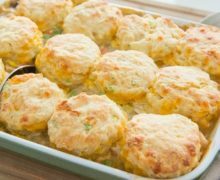 The sauce is a little bit smoky and rich from a splash of BBQ sauce, and cheddar biscuits replace the usual pie crust. I don’t know how I made it this far in my life without ever having a biscuit topped chicken pie. 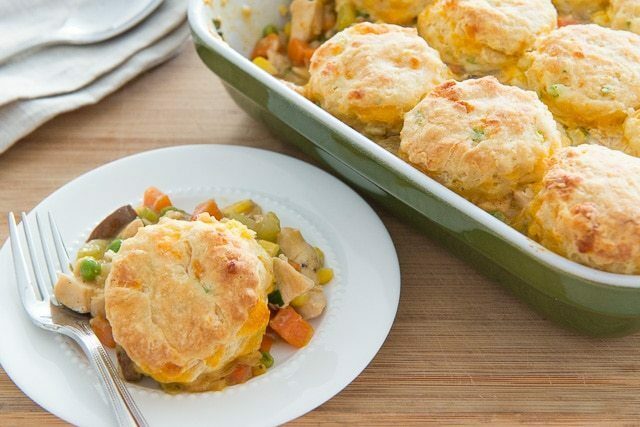 I mean, we’ve been over the fact that Chicken Pot Pie was very present in my childhood and that it’s one of my big brother’s all-time favorite foods (especially these crust-generous Handheld Chicken Pot Pies), and putting biscuits on top instead of pie crust seems so brilliant yet obvious too. (And many of you reading this are probably like, Joanne…I’ve been eating this for years). Well, it’s new to me and I’m very excited about it! This recipe is from my friend Andie Mitchell’s cookbook Eating in the Middle: A Mostly Wholesome Cookbook. It’s very likely you know Andie already, as she’s a fellow food blogger, and also the author of the New York Times bestselling memoir It Was Me All Along, which takes you inside her weight loss journey and personal story. After losing 135 pounds, Andie now eats with a mantra that I personally love and agree with 100%, which is eating somewhere in the middle. Eating a lot of healthy meals, salads, vegetables, and so on, but also making room for chocolate cake and indulgent things, because really, a life without cake is incomprehensible. 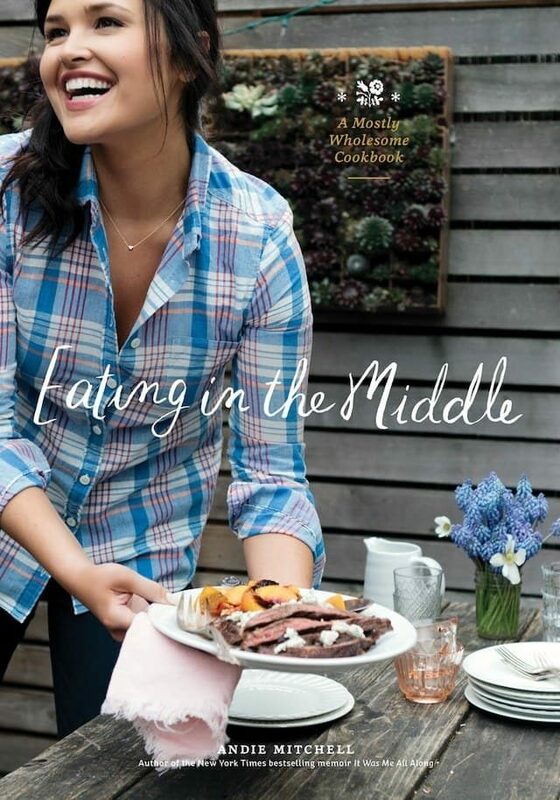 Andie’s cookbook is filled with a balance of recipes, with lots of ideas for wholesome day-to-day meals, but also her favorite indulgences. Other favorites are the Peanut Butter Mousse Pie with Marshmallow Whipped Cream and Lightened Up Pad Thai, but today we’re doing this comforting Biscuit Chicken Pie. (Andie’s recipe calls for chives, but I’m a cheddar scallion fiend). Stick the biscuits in the refrigerator while you make the filling. Finally, add a little bit of barbecue sauce and fresh parsley. I was surprised to see barbecue sauce on the ingredients list, but I went with it and really enjoyed the flavor it added. Now you’re ready to serve. Enjoy! I found that leftovers keep well for several days. The biscuits won’t be quite the same, but they’re still delicious. For the chicken, preheat the oven to 400 degrees F. Place the chicken breasts on a large baking sheet, rub them with the oil, salt, and pepper. Roast until the skin is crispy and the chicken is cooked through, 35 to 40 minutes. Let cool for 10 minutes. Remove the skin, pull the chicken off the bone, and chop the chicken. 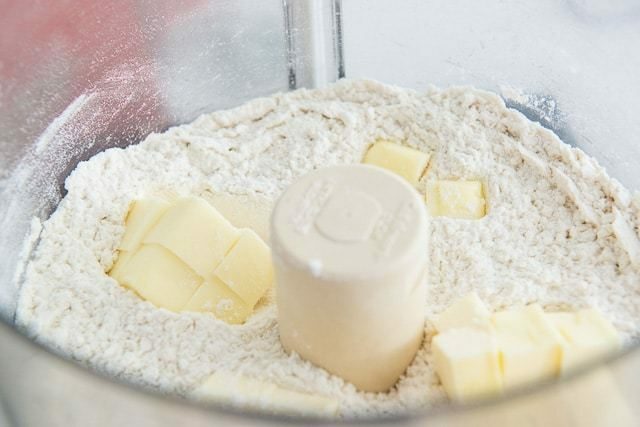 Increase the oven temperature to 450 degrees F.
For the biscuit topping, in the bowl of a food processor, pulse the flour, baking powder, baking soda, sugar, garlic powder, and salt. Add the cold butter pieces and pulse until the mixture is crumbly and resembles cornmeal, about 7 pulses. Transfer the mixture to a bowl and add the buttermilk. Using a rubber spatula, stir just until combined. 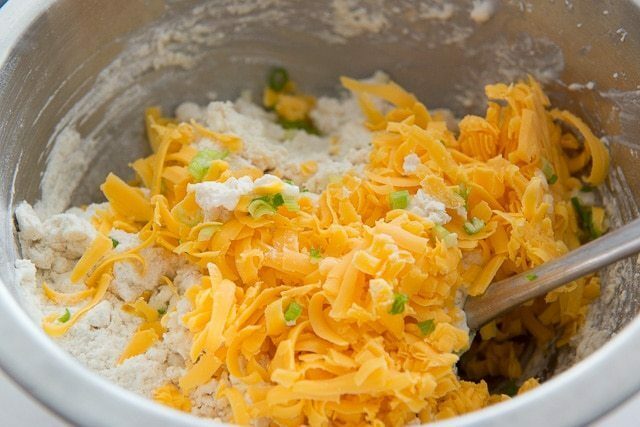 Stir in the cheese and chives. The dough will be wet and lumpy. 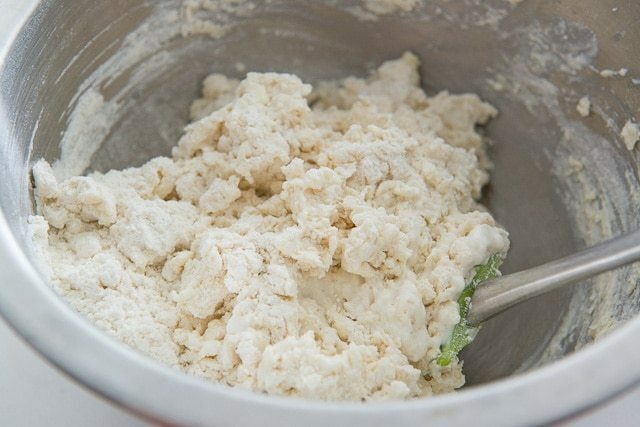 Turn the dough onto a clean, lightly floured work surface and knead it 3 to 4 times, just until it combes together. 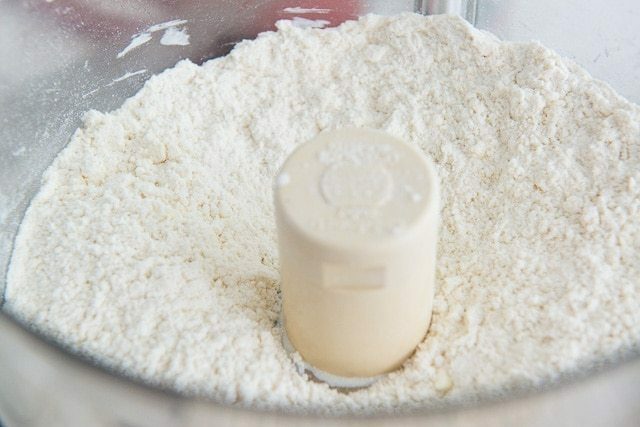 Dust a rolling pin with flour and roll the dough into a 7×10-inch rectangle, about 1 inch thick. Using the rim of a drinking glass or a biscuit cutter, cut 8** rounds out of the dough. 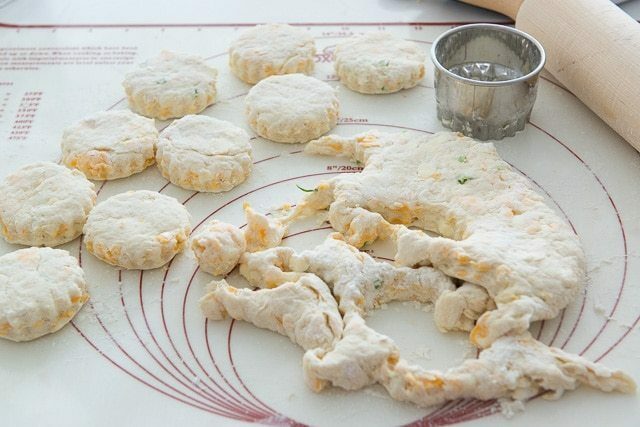 Place the biscuits on a parchment paper-lined plate and refrigerate while you make the filling. For the filling, spray a 9×13-inch baking dish with nonstick cooking spray. Set aside. In a large pot, melt the butter over medium-high heat. 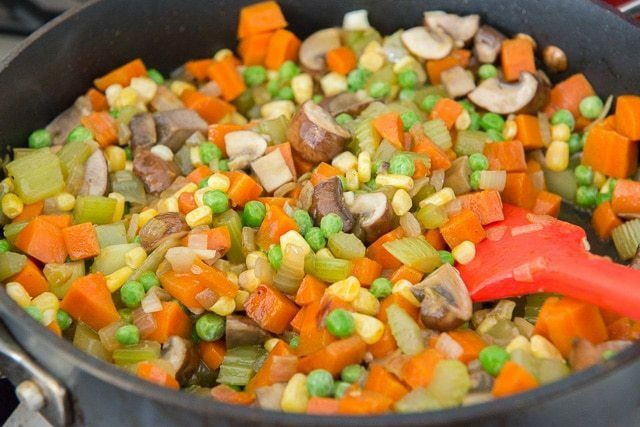 Add the onion, celery, carrots, salt, and pepper, and cook, stirring frequently, until soft, 6 to 8 minutes. Add the mushrooms and cook, stirring occasionally, until soft, about 5 minutes. Add the garlic and cook, stirring constantly, until fragrant, 30 seconds. 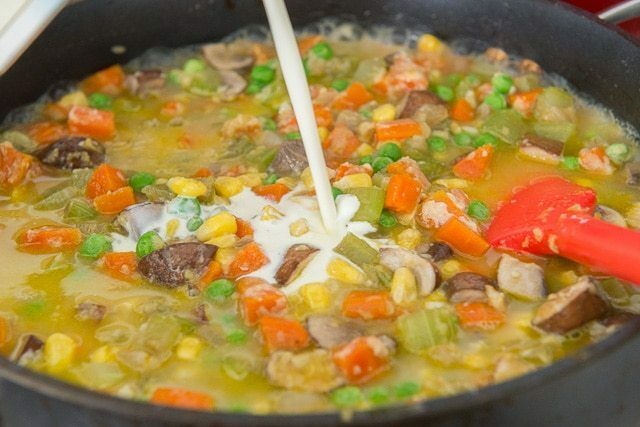 Add the peas and corn. 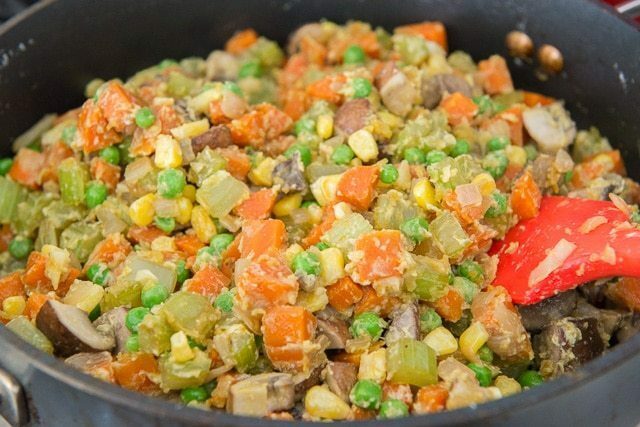 Add the flour and cook, stirring constantly, until the vegetables are completely coated, 2 minutes. Slowly add the broth and the heavy cream and bring the mixture to a gentle boil. 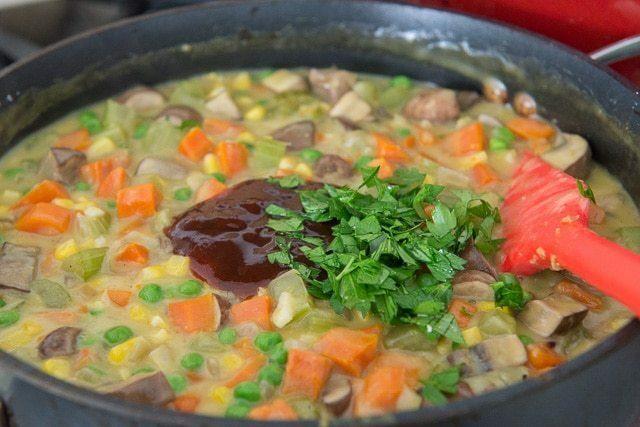 Reduce the heat to medium-low and simmer, stirring frequently, until thickened, 4 to 6 minutes. Stir in the barbecue sauce and parsley. Add the chicken, toss to coat, and transfer the mixture to the baking dish. Bake for 15 minutes. 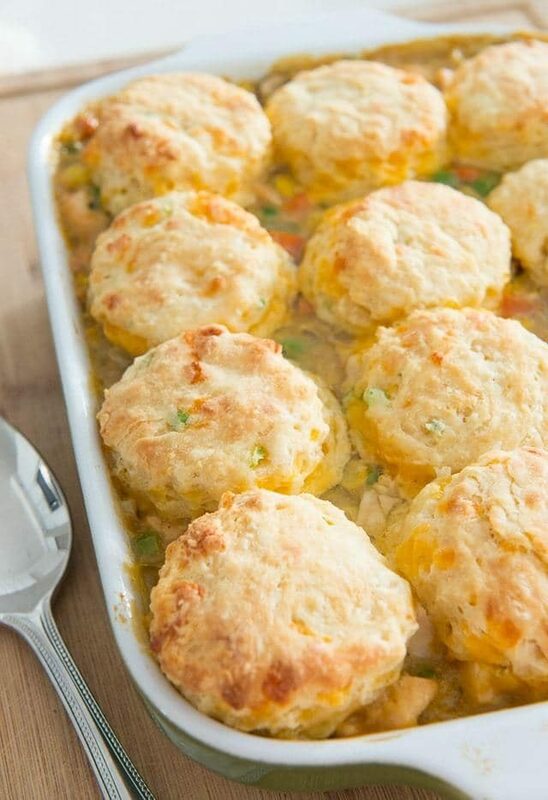 Remove the dish from the oven, top with the biscuits, and brush the tops of the biscuits with the melted butter. Bake until the biscuits are golden brown, 10 to 12 minutes. Enjoy! *I skipped the first part of roasting the chicken, and used my slow cooker chicken breast instead. You could also use storebought rotisserie chicken. **I actually cut 12, to fit the dish. This looks great. I’ve never added BBQ sauce to my chicken pie but I’m open to new things. 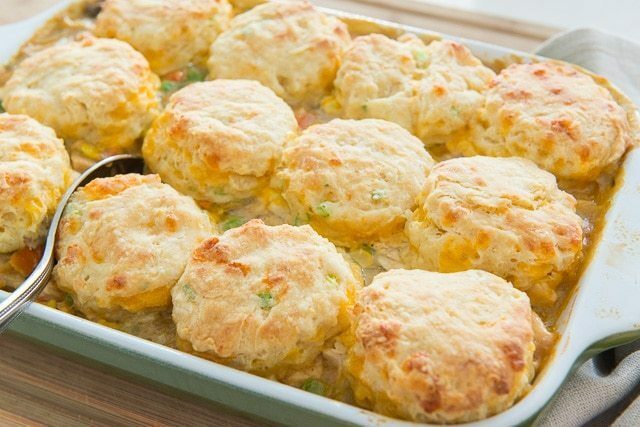 I like the idea of the cheddar biscuits instead of regular drop biscuits. I was going to make chicken tikka masala this weekend but maybe I’ll try this recipe. It has a lot of different parts but I loved the end result. Lots of leftovers too! This recipe is very much like one of the few recipes I used to feed myself after I became widowed. After 15 years, I am learning to cook a little. 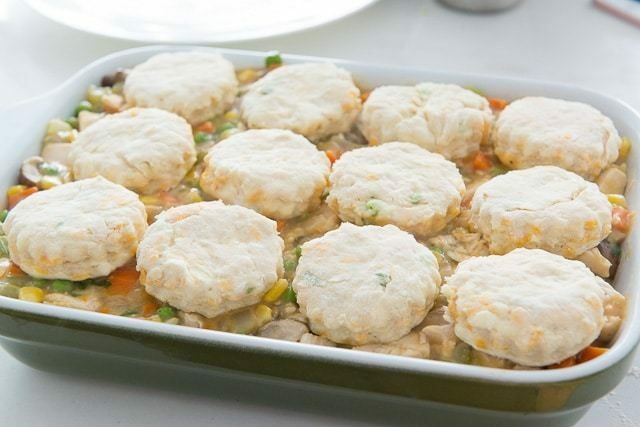 I search for a recipe to cook scallops which led me to the chicken pot pie with biscuits. I knew then that i had found the source of a better diet for my remaining years. By the way, the scallops turned out exactly as your recipe said. They were delicious. Thanks! Hi Bud, thanks for your comment. Sorry to hear you became widowed. Good for you for trying out some new recipes and meals, and I’m glad the scallops went well!